The <?xml:namespace prefix = st1 ns = "urn:schemas-microsoft-com:office:smarttags" />Nature Valley folks have jumped on the dehydrated fruit bandwagon, and we couldn't be happier. Each perfectly portioned cinnamonlicious pouch of chewy, crunchy, baked apple goodness has just 50 calories. Plus, you get to snack on chips (always a fun thing to do) with the healthy benefits of fruit. Bonus! Unlike so many of our favorite dehydrated fruit snacks, these are fairly easy to locate. We found ‘em in the snack food aisle of our local grocery store. These also come in Original Apple, but the cinnamon ones are our faves. We get super-giddy any time we discover a new guilt-free frozen pizza. 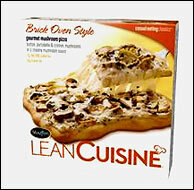 And after tasting Lean Cuisine's Brick Oven Style Gourmet Mushroom Pizza, we actually wanted to throw our arms around the person who created it and give him a big fat hug (we know he's a "him" because we've met Lean Cuisine's famous Chef Andy several times!). This pizza is a bit different from traditional frozen pizzas. For starters, it's square (which we love!). It also has some sort of ROCKIN' creamy mushroom sauce, instead of tomato sauce. We’re also super-impressed with the low nutritionals on this cheesy, mushroom-packed masterpiece. It tastes as good as, if not better than, any fat-packed 'n calorie-infested pie you'd find in the frozen food aisle. Look for the Roasted Garlic Chicken and BBQ Recipe Chicken versions as well. Yum! These all-natural, baked-not-fried, crunchy little wafers are light yet super-satisfying. Each crisp is full of cocoaliciousness, sweetened with cane juice, and filled with organic ingredients like dark cocoa powder and real vanilla. The 90-calorie snack packs make portion-control a cinch. These "thincredible" (their word, not ours--but we like it) crisps come in cinnamon and mocha flavors, too. But the original ones are definitely the best of the trio. 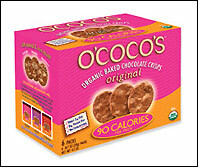 You can order these online at ococos.com, or look for them at natural foods stores. If case you've forgotten, we're real soupies (our word for people who REALLY love soup). We also REALLY love Amy's. So put the two together and BAM!, it's a recipe for success. 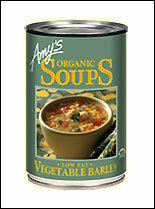 The clever cooks in the Amy's Kitchen kitchen (no, that's not a typo) have managed to cram veggies, broth, and heaps of barley into each can and STILL keep the calorie count down to 70 calories per cup. Insane! And, like all Amy's products, this stuff is organic (weeee!). HG Tip: This soup (like so many canned ones) is a tad high in sodium; so if you watch your salt intake, you might not want to put it into regular rotation. Want MORE exclusive picks from HG? Check out our latest Yahoo! entry on incredible holiday food finds. Hooray!